Various extension service websites say the insects, which resemble our home-grown lady bugs, were imported as early as 1916 to eat aphids and other soft-bodied insects. It’s only been in the last 30 years that they have established themselves pretty much all over the country. 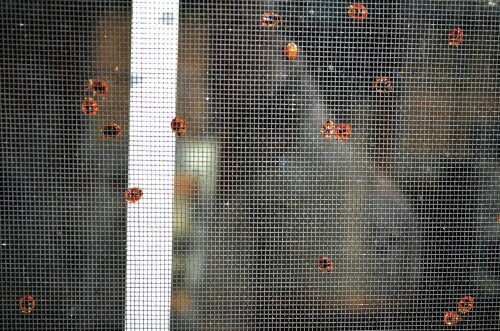 Wife Lila bought 1,500 native lady bugs to control pests in her raised vegetable gardens. 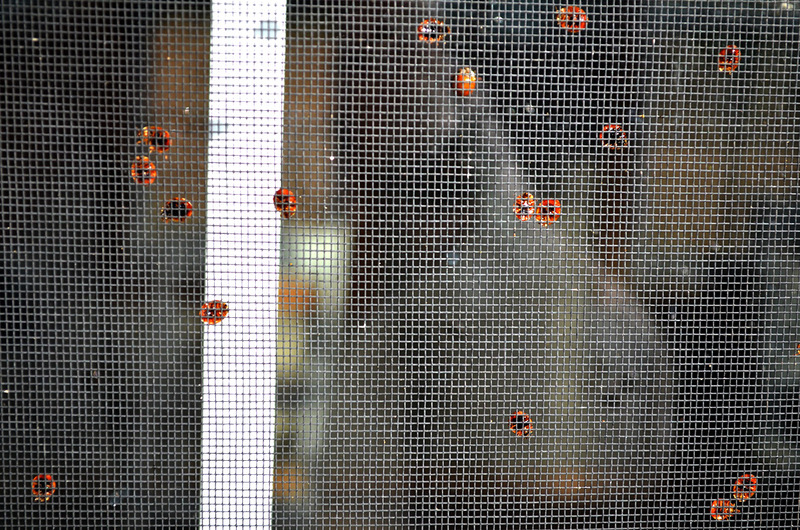 Her brightly colored bugs weren’t nearly so prolific as the foreigners (although you can see them giving it a go to increase their numbers in an R-rated video on Wife Lila’s gardening blog). 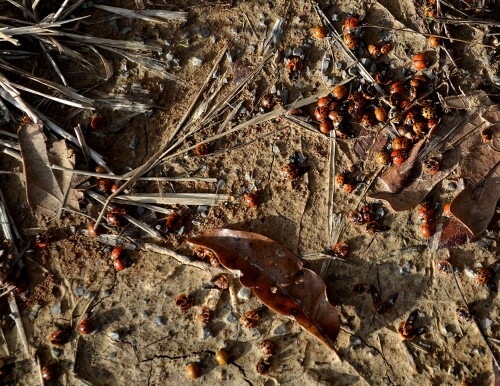 In their native Japan, the bugs spend the winter en masse in rocky outcrops on the sides of mountains. In the U.S., though, they are attracted to light-colored buildings and human houses, where they enter through cracks, crevices and small openings. 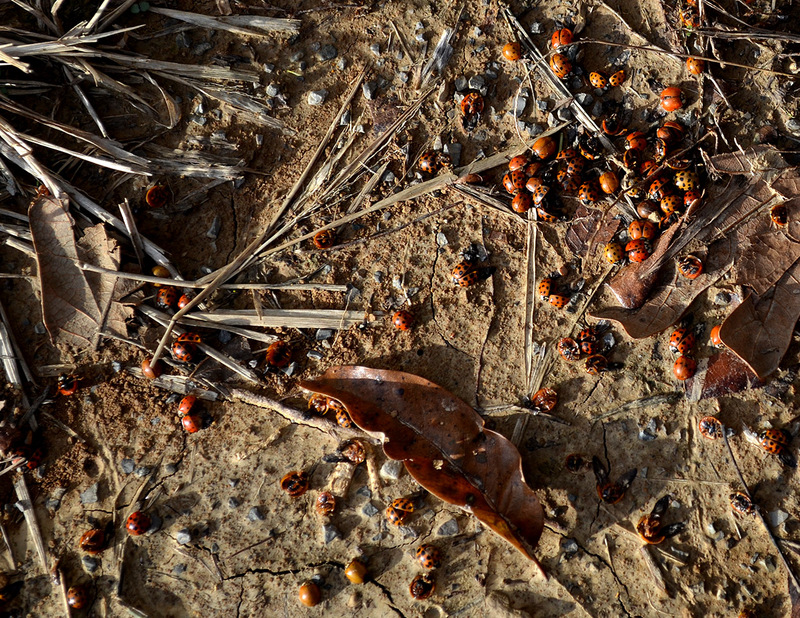 The University of Florida reported that 15-20 thousand of the beetles will invade a single house. A large infestation can be heard moving around inside the walls as they look for a cool place to spend the winter. In Florida, they may not be happy with the warm temperatures inside the walls, so they’ll find an opening that will take them into the air-conditioned interior. Most sites say that their only defense is to emit a yellowish, acrid secretion that can stain surfaces. A Kentucky entomologist writes that when there is a large infestation, some of the insects may land on (and, trust me, UNDER) clothing. Lady beetles, being insect-eaters, have chewing mouthparts, and can bite or “pinch.” The bite, he says, feels like a pinprick and is seldom serious. If they get into your house in large quantities, one way to get rid of them is to chase them down with a vacuum cleaner. It is suggested to create a “trap” inside the cleaner’s hose to “bag” them instead of collecting inside the machine, where their acrid secretion can give your vacuum bad breath for a long time. So Lila is importing these bugs to Florida and Missouri? I live in Illinois and haven’t seen a lady bug for a long time ! Maybe I left them all in Cape Girardeau,Mo. ha! I have quite a few pictures of classmates from Franklin School you might find interesting. I attended Franklin from first to fifth grade (1953-1957). Do you have an email address where I can send the photos?